Apparently, Memorial Day is used as the unofficial benchmark for summer. Indeed, around this time, the days seem to feel hotter and longer. Days of open windows, constant fanning, and shadows left by the strong summer sun are ahead. Illustrator Rebecca Mock has captured these moments wonderfully with her animated illustrations. They are not of a specific series, but have the same feel and setting in the summertime.I cannot use images from her portfolio or the article without asking, but I encourage you to check out this article that has all of her illustrations in this "series" in one place. That and her portfolio are nice places to explore when you have the time. 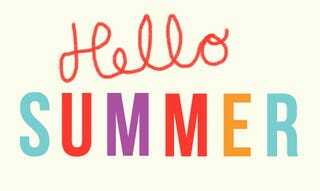 I hope the summer treats you kindly this year!